Through much of the Fed’s modern history, it sat behind closed doors running monetary policy as if the Federal Reserve were some sort of secret society. Indeed, until 1994, they gave virtually no public guidance in regard to monetary policy or interest rates, and purposely sought to keep investors guessing. After Fed meetings, portfolio managers literally found themselves needing to manipulate interest rates by buying and selling short-term debt, in order to see at what yield the Fed intervened. It was their only viable means of determining the level that the Fed was targeting for short-term interest rates (i.e., the Federal Funds or “Fed Funds” Rate). It also left analysts searching for novel and sometimes bizarre methods of helping to discern the Fed’s plans for monetary policy. 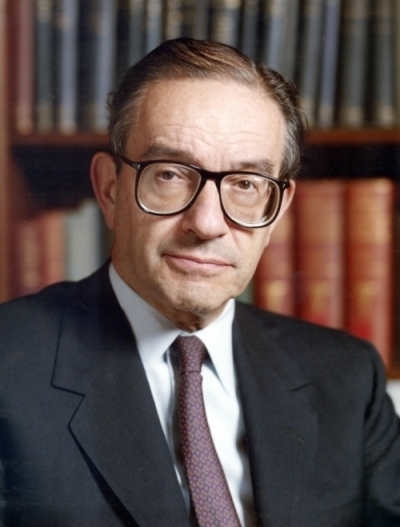 One particularly notable example was the so-called “briefcase indicator”, which came into being when someone perceived that the thickness of the flexible briefcase that Chairman Greenspan carried to every Fed meeting had a correlation with the likelihood that the Fed would raise rates (with a thicker briefcase suggesting a greater probability of a rate increase). After he retired, Greenspan joked that his wife had once fixed him an extra-thick ham sandwich, and it caused the Dow Jones Industrial Average to drop by several percentage points. Importantly, this high degree of secrecy, which is the antithesis of the Fed’s current communication strategy, had some significant advantages for the Fed, and some significant implications for the markets, most of which have been turned on their ear by the Fed’s current push for transparency. Specifically, during the Fed’s more enigmatic past, insight into Fed policy was derived very slowly, and was disseminated to the investing public in a very selective and inefficient way. As a result, opinions changed only gradually, and markets responded deliberately and methodically over time. As noted, this more clandestine approach was quite advantageous to the Fed, as it both limited investors’ ability to take positions in anticipation of future Fed policy (as it was so uncertain and only selectively understood) and greatly limited the ability of markets to impose their will on the Fed and monetary policy. This was in sharp contrast to what we witnessed just three months ago, when the dramatic decline in equities forced a 180-degree reversal in the Fed’s monetary policy guidance. In the years since the financial crisis, when the draconian and experimental nature of monetary policy necessitated the use of complex language and concepts, the Fed’s operations and communication style has become increasingly transparent with each new Fed Chair (Bernanke, Yellen, and now Powell). Indeed, the Fed has been so successful in making sure that their every thought is both clear and immediately disbursed that virtually everyone gets and understand the information at essentially the same time. As a result, everyone changes their opinion over a relatively short timeframe, and it is reflected in the markets almost immediately, thus sometimes causing extraordinary market volatility. 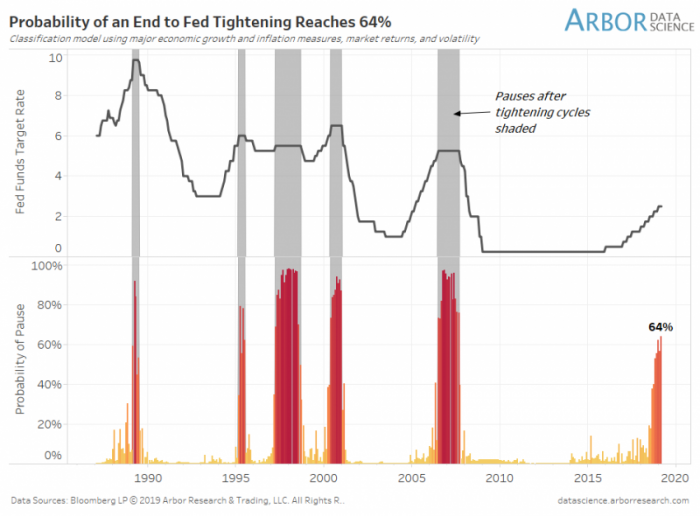 Almost instantly, the collective consciousness of investors reached the conclusion that the Federal Reserve, as has been their history, was once again on the verge of overtightening monetary policy and pushing the economy into recession. This mass and almost immediate change in perception manifested itself in a 20% decline in the stock market that was compressed into only three months. Chairman Powell, to his credit, recognized the message that the markets were sending, and did a complete about-face on January 4th, when he said (again, in plain English) that the Fed could now be “patient” about future rate hikes, and that the reduction in the Fed’s balance sheet (quantitative tightening) was under review, and was no longer on “auto-pilot”. In response, equity markets rebounded back to within striking distance of their old highs at an almost unprecedented pace… a sort of “equal and opposite reaction”. To put the scope of this rebound into some perspective, since the Christmas Eve lows, the trailing P/E multiple (share price per each dollar of earnings) on the S&P 500 has soared from 15.5X to 18.7X earnings, and the forward-looking P/E multiple has jumped from 13.6X to 16.5X expected earnings. Chairman Powell even took the extraordinary step on March 10th of doing an in-depth interview on the 60 Minutes CBS news program, which he used to explain the Fed’s current monetary policy stance to the American public, and then proceeded to combine openness with dovishness on March 20th, when he basically gave investors virtually everything that they could hope for. An addition to announcing that the Fed did not expect to raise interest rates again in 2019 (after recently guiding the markets to expect two more hikes this year), they announced that they were both ending their quantitative tightening (the shrinking of their balance sheet) in September and tapering the remaining monthly reductions from $30 billion to $15 billion starting in May. Central bankers are very hesitant to make such dramatic policy reversals, as it causes them to lose credibility, and because credibility is one of the most valuable assets that a central bank can have. Part of the explanation for the reversal is found in the fact that the Fed downgraded their characterization of the domestic economy in the March 20th Fed statement. It can also be found in the recent collapse in yields across almost all maturities (which is an indication of an impending economic slowdown), and in the recent inversion of the yield curve (where short-term rates rise above long-term rates), thus indicating both that monetary policy is too tight and that a recession is probable over the intermediate term. 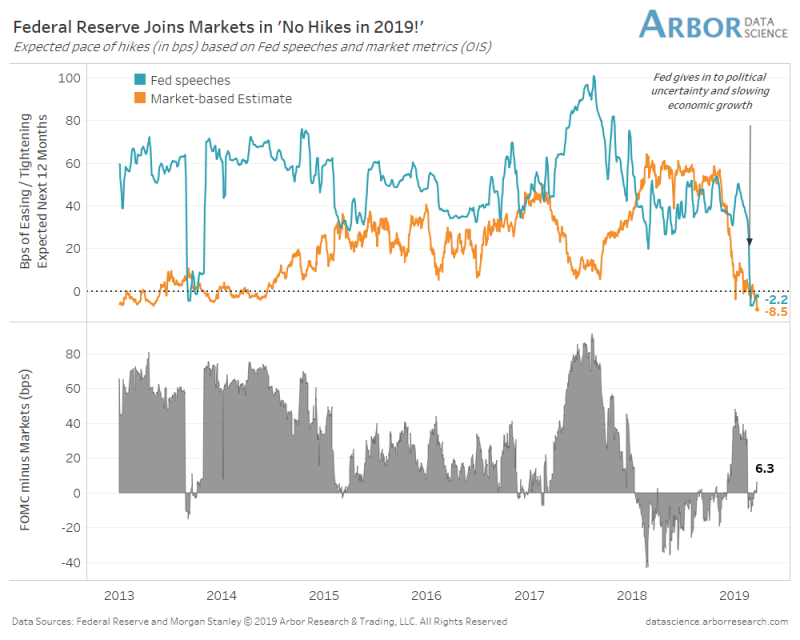 As a result, market expectations have shifted entirely, and the futures markets are increasingly pricing in the likelihood of the Federal Reserve actually cutting short-term rates at least once before the end of the year. So much for the Fed’s ambitions of “normalizing” monetary policy. Instead, rates seem destined to remain well below historic norms, and the Fed will likely end up with a balance sheet in excess of $3.5 trillion, which is 17% of the size of the domestic economy and larger than the entire economy of Canada. 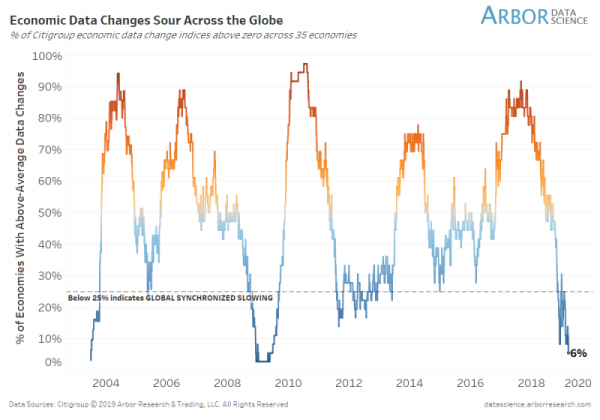 The accelerated slowing in the U.S. economy should hardly be a surprise, as slowing growth overseas has been weighing on the domestic economy for over a year, and “soft” survey-based data in the U.S. has been in a prolonged decline for almost two years. 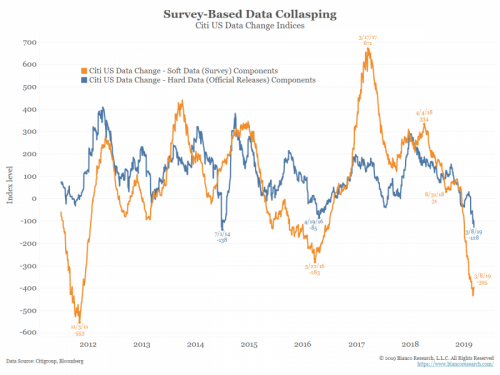 It is just recently, as the world’s other major central banks were scheduled to start “normalizing” monetary policy, that the “hard” economic data joined in the decline. We do not believe that this is just coincidence, as we maintain that this central bank-provided safety net has, since the depths of the financial crisis, served as a major support for investor and consumer confidence, and as a major catalyst for the rebound in the economy and the risk markets. 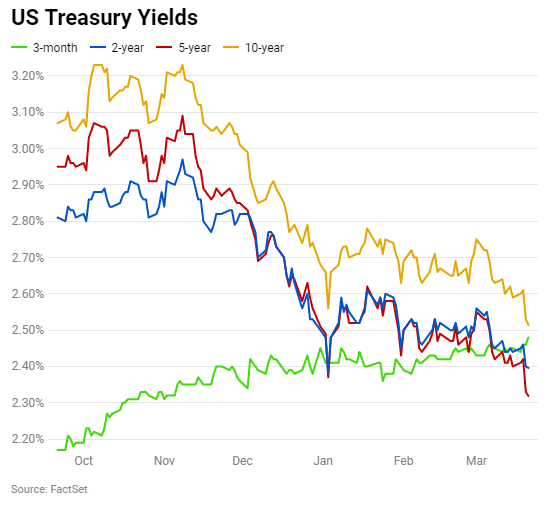 Markets will likely pay particularly close attention to the most recent inversion, where 10-year Treasury yields have dropped below 3-month Treasury yields. This particular inversion (shown as drops below the zero line) have, according to Gluskin Sheff, been 85% accurate as a predictor of impending recessions, albeit with remarkably varied lead times (recessions are marked in grey). Of course, there is some debate whether or not the message of a yield curve inversion has its traditional credibility in a world when approximately one-fifth of all outstanding debt has a negative yield, when the world’s central banks are among the largest buyers of securities, and when monetary authorities have been employing programs (like the Fed’s “Operation Twist”) that were specifically designed to distort the very shape of the yield curve that economists and strategists are relying on for insight. In addition, with growing signs of a significant slowdown in most global economies, and substantial evidence of a potential recession in the European manufacturing sectors, European interest rates have collapsed so completely that the yield on the 10-year German government bond just turned negative. For Europeans in particular, this makes the prospect of buying 10-year U.S. Treasuries, even at a yield of only 2.3%, look pretty appealing. Therefore, it only makes sense that significant foreign demand for Treasury debt is pushing prices higher and yields lower, so the dramatic drop in Treasury yields may be as much a function of foreign demand distorting yields lower, as it is an indication of significant slowing in the U.S. economy. However, while these macro-economic distortions should introduce at least some doubt into the predictive capabilities of a yield curve inversion, it does not eliminate their economic impact, as banks can’t profitably lend money when the yield curve is inverted, as their cost of capital is higher than their lending rates. If yield curve inversions persist, will banks stop lending, which will dry up credit, and force the economy into a slowdown, if not an outright contraction. 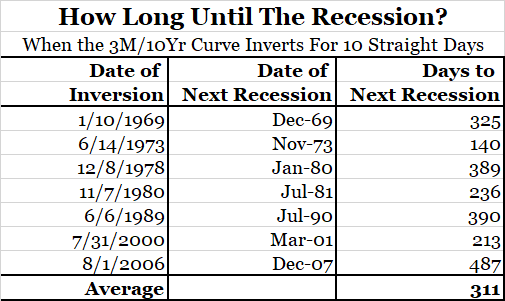 However, it is noteworthy that, this time, the markets perceived the risk of recession very early in the slowdown, which is unusual, as markets and economic models normally do not perceive that there is a risk of recession (i.e. that the Fed would need to stop tightening) until the economy is already in a recession (shown as grey, vertical bars). Moreover, because the Fed responded so immediately to the temper tantrum thrown by the markets in the fourth quarter, there is at least some possibility that they might manage to engineer the much sought after but rarely achieved “soft landing”. Such a “soft landing”, where the Fed manages to slow economic growth to a non-inflationary pace, without over-tightening and catalyzing a recession, is the “holy grail” for a central banker, and something that, because of such long monetary policy lags, is only very rarely accomplished. 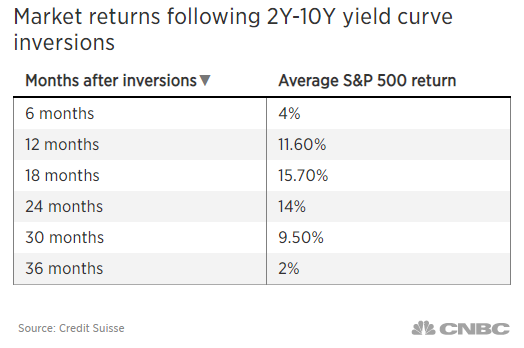 Interestingly, while there has historically been a tight correlation between yield curve inversions and recessions, there has been a surprisingly weak correlation between inversions and equity market returns. 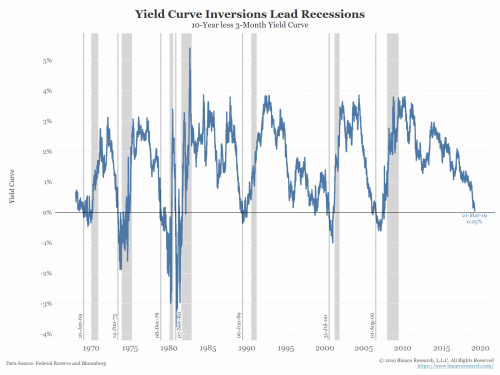 We suspect that this is because investors realize that, in addition to slower growth, yield curve inversions usually also usher in more accommodative monetary policies, which are like ambrosia for both stocks and bonds. Indeed, monetary accommodation is already happening. Through its incredibly dovish guidance, the Fed has lowered interest rates across all maturities. At the same time, the European Central Bank not only announced that they were both delaying for at least a year their planned rate hikes and were reintroducing new low-cost loan programs, but even hinted at a possible resumption of a quantitative easing program, which they just ended about 2 months ago. The Bank of Japan has also reengaged in aggressive quantitative easing programs, and is buying so many securities that they currently own 75% of the Japanese ETF market. Even the Bank of China is reintroducing credit stimulus on a massive scale, and the government committed to “cut into its own flesh”, if necessary, to stimulate the economy. The good news is that accommodative monetary policy is normally quite bullish for stocks, bonds, and ultimately economic growth. The bad news is that central bankers don’t throw buckets of monetary liquidity at healthy economies, and there are many signs that the global economic expansion is growing very long in the tooth. The world’s central banks have taken their respective feet off of the brakes, and a few have even started applying pressure to the accelerator. 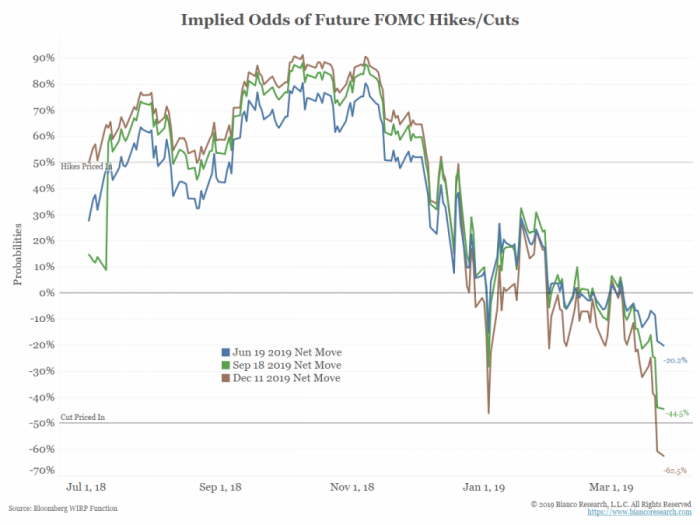 Further, as was illustrated above, the futures markets are pricing in at least one rate cut by the Fed. However, any monetary stimulus enacted today is likely, based upon history, to take at least 12-18 months to stimulate the economy, while the slowing influences of the nine rate hikes that the Fed has already implemented (combined with their quantitative tightening program) is probably just starting to drag on economic growth. While the return to a more accommodative monetary policy should be a positive for investors, the outlook for the equity markets is still likely to be challenging. Indeed, in many ways, recent volatility is just a continuation of what we have witnessed over the past five quarters, during which we have seen three huge rallies, two huge declines, and virtually zero net appreciation for the broad equity markets. Moreover, while the stock market is back near its old highs, neither the economy nor the stock market’s internals look anywhere as strong as they did the first time that markets reached current price levels in January of 2018. 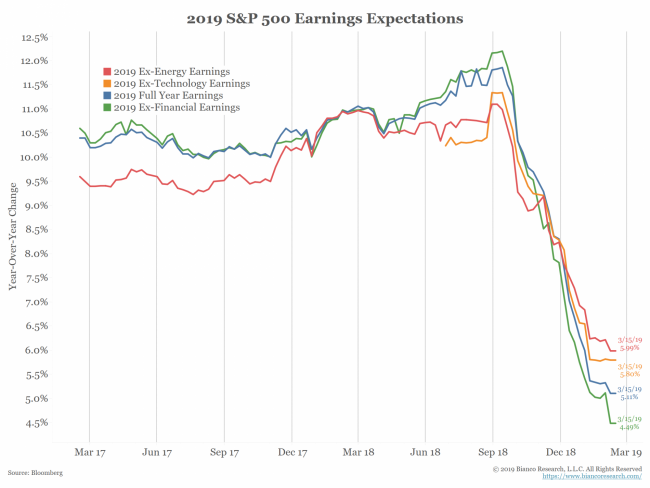 This time, the economy is slowing, and expectations for corporate profit growth have declined from over 20% last year to around 5% for 2019. It is also noteworthy that, according to Gluskin Sheff, when the markets reached new highs in January of last year, the median average stock was only 1% from making a new all-time high. On the most recent test of those levels, the median average stock was still 12% away from all-time highs, which indicates that many stocks are no longer participating in the uptrend. The equity markets have also reached a level of significant technical resistance around last year’s October through November highs, where the supply of shares available for sale continues to overwhelm buyers. One of the peculiarities of the first quarter rebound in the equity markets is that it seems to have taken place without any significant flows into either equity mutual funds or ETFs (exchange-traded funds). Indeed, according to Jason Trennert of Strategas Research Partners, small investors have actually been net sellers of equities on a year-to-date basis, with $1 trillion of inflows into ETFs, but $1.3 trillion of outflows from equity mutual funds. This is further supported by a March 14th report from Bank of America Merrill Lynch, which noted that investors have pulled a net $46 billion out of equity funds thus far in 2019. 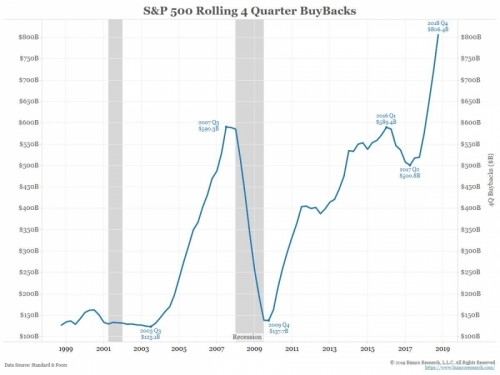 Evidence suggests that much of the first quarter rebound was instead powered by short-covering (which is why the most heavily shorted stocks rebounded the most, and why net speculative short S&P 500 positions plunged about 25% to start the year), and by corporations buying their own shares (perhaps accelerated by proposals to limit future buybacks). In 2018, corporate buybacks soared to a record $806.4 billion, which is a 55% jump from 2017. There is also some anecdotal evidence that we think may be important. When the Federal Reserve gave the markets even more dovish guidance than they could have ever reasonably hoped for on March 20th, stock prices declined anyway. And when the Mueller Report gave the markets even more certainty than they could have ever reasonably hoped for, equity prices went down regardless. When markets show an inability to rally in the face of “good” news, it has not historically been an optimistic sign for growth investors. That said, our premise is still that the primary trend in equities remains higher over time, but that we might be entering into the type of environment where stock selection and a more tactical (and perhaps more conservative) approach to investing finally starts to pay dividends. The price-to-earnings ratio (P/E ratio) is the ratio for valuing a company that measures its current share price relative to its per-share earnings (EPS). The price-to-earnings ratio is also sometimes known as the price multiple or the earnings multiple. Formula: P/E ratio = Market Value per Share ÷ Earnings per Share.